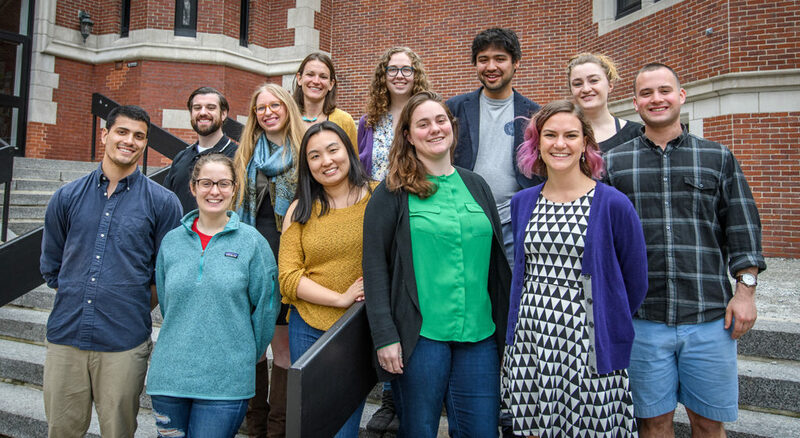 Students in this year’s Wildlife Conservation GIS Research Seminar in the Graduate School of Geography included front, from left, Rishi Singh, Mary Molloy, Jeanie Lai, Caitlin Cassisi, Kelsey Meisenhelder, and Eli Simonson; back, from left, Andrew Burke, Ali Filipovic, Meghan Kelly, Lucy Lee, Nick Geron, and Spring Pillsbury. As it works to preserve the world’s wild places, home to endangered and threatened species like elephants, tigers, whales, and walruses, the Wildlife Conservation Society regularly turns to Clark GIS Consulting in the University’s Graduate School of Geography. “Over the last six years, we at the Wildlife Conservation Society have come to this class and posed questions that we don’t have an answer to,” David Wilkie, WCS director of conservation measures, says. Yet professors don’t comprise this research consultant group; students do. 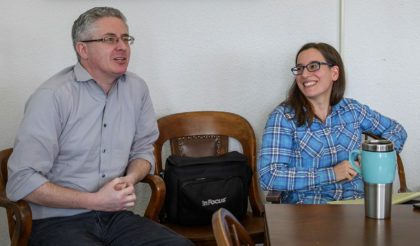 Clark GIS Consulting is part of the Wildlife Conservation GIS Research Seminar taught each spring by Professor John Rogan and Assistant Professor Florencia Sangermano, M.A. ’08, Ph.D. ’09. The students — a mix of doctoral and master’s candidates and upper-level undergraduates — have assisted with Wildlife Conservation Society biodiversity projects across the globe, from the grasslands and forests of Asia and Africa to marine habitats in Papua New Guinea and the Congo River basin. The seminar gives students the opportunity to hone their remote sensing, geographic information science (GIS), and ecological research skills. Remote sensing allows scientists to gather data from afar via satellite and other technologies. By inputting data into Clark Labs’ TerrSet/IDRISI geographic information system (also known as GIS), the students can integrate information and develop complex, multicolored maps and images depicting changes in land and ocean environments. They also can model patterns and trends. In 2013, Clark Consulting gathered GPS data collected from radio collars affixed to elephants roaming near Tanzania’s Tarangire Park. The Wildlife Conservation Society has worked with the park and surrounding villages to identify corridors where elephants can travel without disturbing farmers’ fields. The students’ work “helped the government think about where they were putting in a new road, because the planned road went straight through the corridor for the elephants,” Wilkie said. This year, the Wildlife Conservation Society asked Clark Consulting for help with conservation issues in two of its “global priority regions”: the Arctic’s Northwest Passage and Patagonia’s continental shelf in the southwest Atlantic Ocean. Students on the Arctic team examined trends in declining sea ice in the Northwest Passage to understand the impact on Pacific and Atlantic walruses. The marine mammals need vast areas to “haul out” and move to feeding areas where they congregate, rest, and raise their young. “We focused on the walrus because it’s important to native Alaskans. It’s a cultural icon, and the walruses’ feeding behavior, their haul-out behavior, is changing, and the native Alaskans’ ability to hunt walruses is changing,” Wilkie said. The Patagonia team focused on illegal fishing of the Argentine shortfin squid in one of the largest fisheries in the world, near Argentina and the Falkland Islands. Fed by currents from warm South American and cold Antarctic waters, this nutrient-rich area in the vast continental shelf produces huge phytoplankton blooms, the basis of the ocean’s food chain, and sustains large populations of elephant seals, Magellanic penguins, albatrosses, whales, and other species. 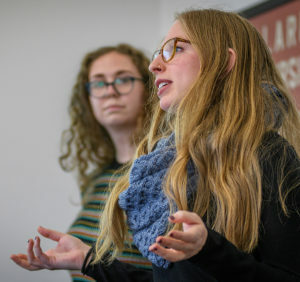 Wilkie directed students to develop a model to help the Argentine government predict and monitor illegal squid fishing in its exclusive economic zone (EEZ) — the area within 200 miles of the country’s coast — and in marine protected areas (MPAs). WCS has worked with Argentina on a proposed Blue Hole high seas marine protected area, extending from the EEZ out into open, international waters. He suggested that Clark Consulting narrow down the monitoring area by zeroing in on the timing and location of phytoplankton blooms — the food source that draws fish — and, therefore, illegal fishing. He also directed the student-consultants to map shipping patterns across the continental shelf to determine which ships are passing through and which are illegally fishing. Argentine government “is open to moving the shipping lanes for conservation reasons if we can provide this information,” Wilkie added. Throughout the semester, the two Clark teams provided monthly progress reports to Wilkie and Danielle LaBruna, a GIS specialist with the Wildlife Conservation Society. The students fielded the conservationists’ questions via Skype, and responded to their requests to refocus or dig deeper. 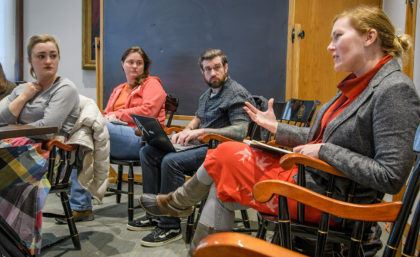 Experts like Karen Frey, an associate professor of geography at Clark and a polar scientist who has studied declining sea ice, also provided input on the students’ research. 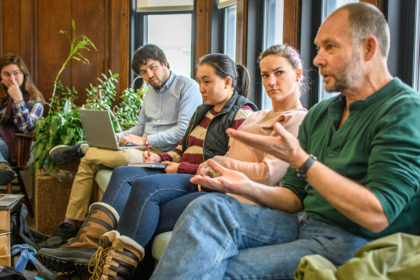 Geography Professor Karen Frey advises the Arctic team about questions to pursue and possible sources of data that might help them better understand environmental changes in the region. 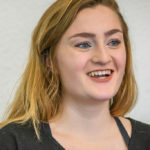 Like other classes before them, this year’s teams reported their findings in May to a roomful of Wildlife Conservation Society professionals at the organization’s headquarters at the Bronx Zoo. Field conservationists from across the world joined the conversation via Skype. The Arctic group presented historical data on sea ice concentration, sea surface temperature, bathymetry (depth of water), salinity, oxygen, and various nutrients. The information will allow conservationists to project changes to the walruses’ habitat and their main food source, mollusks located up to 100 meters deep. “We’re sitting at this point in time knowing that there have been decreases in sea ice in the past few years, knowing that there’s a threat of drilling in this region, and yet there’s still no protection for the walrus,” said Alexandra Filipovic ’17, M.S.-GIS ’18. “In particular, changing sea-ice dynamics has an impact on females with young,” as they access summer ice for foraging. To protect the walrus, the students proposed that policy experts limit oil and gas extraction in the Hanna Shoals — which is fast losing sea ice in the summer months. They also suggested that policies be implemented to curb shipping activity — which has increased in the Arctic due to decreasing summer ice — in Lancaster and Smith sounds. The Wildlife Conservation Society particularly was interested in the correlation students made between solar cycles and the changes in the concentration of ice in Lancaster Sound. Known as the Last Ice Area, the region soon will be home to the Arctic’s last summer sea ice, which is projected to disappear forever between 2030 and 2050, according to scientists. “When sunspots decrease, ice concentrations increase, so we think that could be a factor in ice persistence in this area over time,” said Lucy Lee, M.S.-GISDE ’18. By modeling such trends, scientists could anticipate summers of low ice concentration, when the Atlantic walrus might need to find more haul-outs on land, she added. In the Patagonia project, Clark Consulting sought to understand the extent of illegal fishing. They compared fishing data reported to Global Fishing Watch — a nonprofit organization that promotes ocean sustainability — with satellite images of nighttime lights and information from ships’ automatic identification system tracking devices. 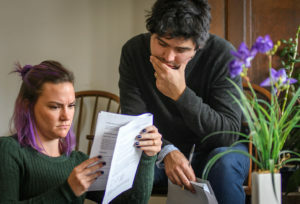 The students noted that almost one-quarter of the illegal fishing they detected was occurring in the proposed Blue Hole area, north of the Falkland Islands. They suggested the Argentine government close fisheries in vulnerable areas and at times when the squid population decreases, such as during the El Niño weather cycle. Their examination of data shows decreased chlorophyll a (indicating fewer phytoplankton blooms) and increased sea-surface temperatures, leading to decreased squid populations, during El Niño. “We examined these relationships with global climatic patterns and found a significant connection to the El Niño phenomenon,” said Kelsey Meisenhelder, M.S.-GISDE ’18. “The Clark University results can definitely help frame the conversation around patrolling for illegal fishing,” LaBruna said. “The students’ work is of interest to our field staff, and provides a platform for further engaging with the Argentine government on how to approach patrolling of existing and future [marine protected areas].